IPEX, the North American leader in thermoplastic piping systems, partnered with Dynamic Conveyor Corporation to reduce cycle times in the manufacture of its injection molded municipal pressure and gravity piping systems. As a leader in thermoplastic piping for more than 50 years, IPEX manufactures pipes, valves and fittings from a diverse range of materials including PVC, CPVC, ABS, PP, PVDF, PEX, PE and their innovative plastic and metal composites. IPEX products are engineered to handle the full range of today’s municipal, industrial, commercial and residential applications. The cycle time for molding IPEX’s heavy wall fittings was very long due to the time needed to cool the parts. The parts were cooled inside the mold during the molding cycle. If IPEX were to speed up the cycle of the molding machine, by reducing the cooling time, the parts would deform while cooling and be unusable. 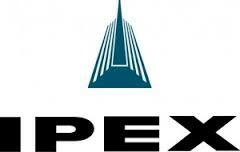 IPEX approached Dynamic Conveyor with a request to develop a water cooling conveyance system. “After searching the Internet for a supplier, we found only one supplier that offered a conveyor made of plastic that would not deteriorate due to long periods of running water” said Ric Atchison, Technical Manager of IPEX in London, Ontario. Dynamic Conveyor worked with IPEX to develop a system that places the molded fittings onto a conveyor that is immersed into a water bath tank allowing the parts to cool. After the parts are cooled, the conveyor takes them out of the water tank and dries them. “By cooling the parts with the DynaCon waterbath conveying solution, we have been able to reduce cycle times by up to 40%” explained Atchinson. The water cooled parts pass all dimensional and functional testing. The water bath cooling system provided by Dynamic Conveyor consists of a plastic modular conveyor with drive flights. The drive flights carry the fittings through the water cooling tank and bring them out of the water to be dried by air amplifiers, an accessory item provided by Dynamic Conveyor. The DynaCon process reduces the total time needed to manufacture the parts. IPEX installed the system in the fall of 2007 and foresees regaining the cost of the conveying system within 10 months of its purchase. “Following that our expectation is to enjoy annual cost savings of around $65,000 per year” said Atchinson. “We like the modularity that the DynaCon conveyor system offers,” said Atchinson. “We are very satisfied with the solution provided by Dynamic Conveyor. The after the sale support has been great. Dynamic Conveyor is an easy company to work with”.